Usually ships within 7 to 9 business days. 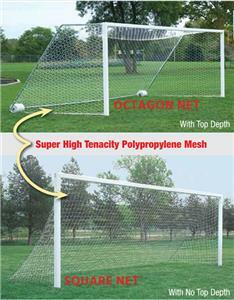 These premium nets are designed specifically for Bison soccer goals but can be used on any soccer goal with comparable top and bottom depth...Constructed of heavy super high tenacity polypropylene (HTPP) multifilament rachel knotless netting, these nets are non-abrasive for superior durability and safety. NETS ONLY - Goals are not included. Picture is for example. Notice! Soccer nets are not returnable once opened unless defective. Good quality nets and fast shipping!